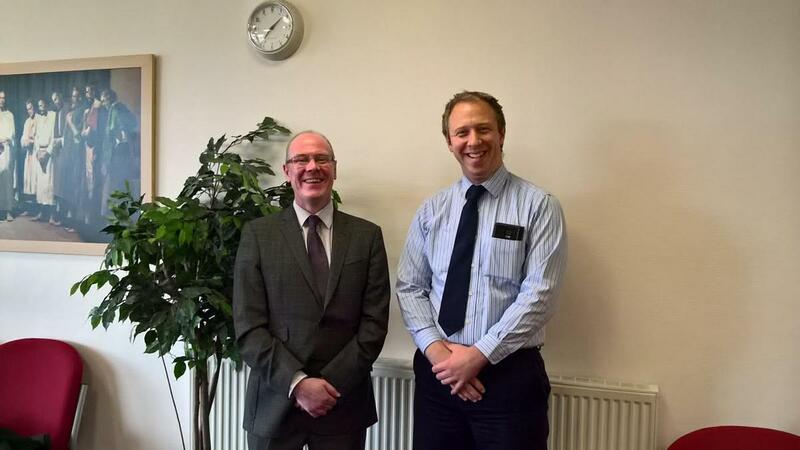 Bishop Scott Goldie, local leader of The Church of Jesus Christ of Latter-day Saints in Aberdeen, Scotland recently hosted Mr Kevin Stewart, the Member of the Scottish Parliament for Aberdeen Central. Mr Stewart is the Minister for Local Government and Housing. This meeting was requested by Mr Stewart who wanted to know what the church does in the local area. During the meeting, Bishop Goldie was able to explain that members of the Church are encouraged to serve in their local communities, to the extent that they are able. Many members serve in a private capacity but the Church organises many service projects, often to benefit the poor and the needy. The examples that Bishop Goldie shared included tending gardens at a respite care home, painting a local community centre, stewarding at “Celebrate Aberdeen”, charity fund raising, helping refugees and working with other faith groups. A regular service commitment by members is to help out with Poppy Scotland raising funds every year by volunteering to collect donations at local venues. Elgin and Inverness congregations were involved in the Poppy Appeal and there were more than 60 Church members taking part in collecting donations around Aberdeen with 15 remembrance wreaths laid. At the conclusion of the meeting, which lasted about an hour, Bishop Goldie gave Mr Stewart a conducted tour of the Church building, showing him the wonderful facilities that members have access to. Bishop Goldie works as an economist for an oil company and his ministry is carried out on a voluntary basis.